Mix chicken broth, cornstarch, soy sauce, red pepper flakes and brown sugar. Set aside. Peel shrimp. Press garlic. Grate ginger. Thinly slice red onion. Cut ends of squash off. Cut in half lengthwise and remove seeds. Julienne squash into "spaghetti" threads. Heat coconut oil in wok. Add garlic, ginger and onion. Cook until ginger and garlic are fragrant. Add sugar snap peas, squash threads and shrimp. Stir fry until shrimp is pink and opaque. Stir sauce ingredients and pour into wok. Mix thoroughly, lower heat and simmer until thickened. Serve immediately. 93 members have added this recipe to their cookbook. 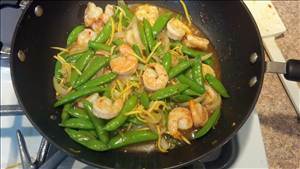 There are 224 calories in 1 serving of Asian Skillet Shrimp and Sugar Snap Peas. Calorie break-down: 31% fat, 28% carbs, 42% protein.